It's been a little too cold to play outside for long, so I've been trying to come up with ideas to keep the kids busy inside. Today I cut up a few potatoes into snow flake and snowman shapes. 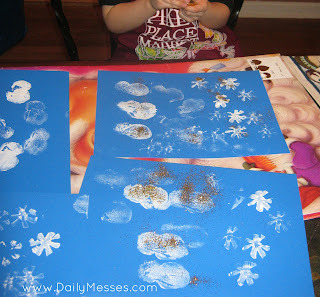 I gave the kids white craft paint, glitter, and blue paper and let them stamp away. They had a blast! 1. Cut potato in half. This will make two stamps. 2. Cut out shape out of flat part of the potato. DM Tip: Use a pen/marker to trace out the shape on the flat part of the potato before you cut out the shape. Be careful not to cut yourself! 3. 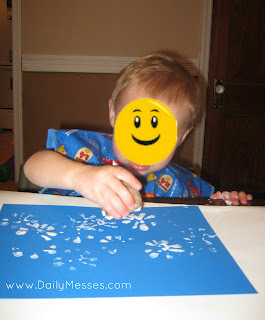 Dip the cut out stamp part in paint and stamp away! 4. Optional: Sprinkle glitter onto the wet paint. new follower from the blog hop. Hope you will return the favor.